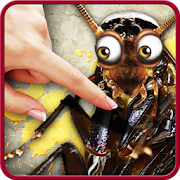 Bug smasher it is cool, free game. Start your adventure with a bug smasher now! You must smash the bugs: cockroaches, ants, flies, larvae. For each smashed bug you get points. Tap the bug to smash it. Avoid wasps, bees, scorpions, ladybugs – do not touch them! Tap the 3 wasps, bees, scorpions, ladybugs or miss 3 other bugs – the game will be over. Smash the bubble with red heart – you will get an extra life. In case of any problems with the effect of Bug smasher, instead of giving us the negative opinion, please send us an e-mail and review briefly the problem. It will help us to solve it in the next updates of game. Bug smasher is free but contains ads. Revenue from advertising will help us to create new attractive game, wallpapers and applications. All permissions are required only for advertising and are supported by trusted vendors.